Melvin Herbert Evans was born on August 7, 1917, in Christiansted, St. Croix, Virgin Islands. He attended public schools until entering Howard University where he received his B.S. in 1940. In 1944 he received his M.D. from Howard College of Medicine, whereupon he served in a variety of medical and public health posts at hospitals and institutions in the United States until 1959. From 1959 to 1967 Evans served as a health commissioner in the Virgin Islands. In 1969, President Richard Nixon appointed Evans, a Republican, as Governor of the Virgin Islands. In 1970, after the Virgin Islands Elective Governor Act allowed for the election of a governor by the territory’s residents, Evans became the first popularly elected governor, serving for five years. Afterward, he was a Republican National Committeeman for the Virgin Islands from 1976 to 1980. In 1978 Melvin Evans was elected as the Virgin Islands Non-Voting Delegate to the United States House of Representatives in Washington, D.C. Evans was sworn into the Ninety-sixth Congress on January 3, 1979. Despite his non-voting status, Evans served on various Congressional committees including Armed Services, Interior and Insular Affairs, and Merchant Marine and Fisheries Committees. Evans was able to secure federal funds to help provide the Virgin Islands’ public school system with additional programs and services. He also eased the shortage of doctors at local health facilities in the Islands by initiating special legislation that permitted physicians who were not U.S. citizens to practice there. Evans supported the designation of legal national holiday honoring Martin Luther King, Jr. and opposed the elimination of court-ordered busing until alternatives were offered. Evans served in Congress only one term, losing in 1980 to Democrat Rod de Lugo in his reelection bid. In 1981 he was appointed United States Ambassador to Trinidad and Tobago and served in that office until his death in Christiansted on November 27, 1984. 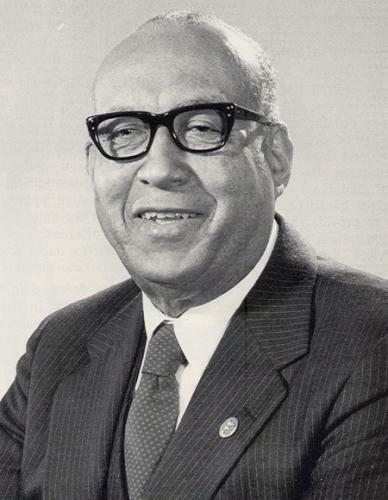 Bruce Ragsdale, Black Americans in Congress, 1870-1989 (Washington: Government Printing Office, 1990); http://bioguide.congress.gov/scripts/biodisplay.pl?index=E000254.